Time To Paint Your Roof? Trained, Experience Tradesmen. Along Side Premium Roof Paint. We want to earn your business by providing you with quality roof painting with premium products backed with a 10 year warranty. 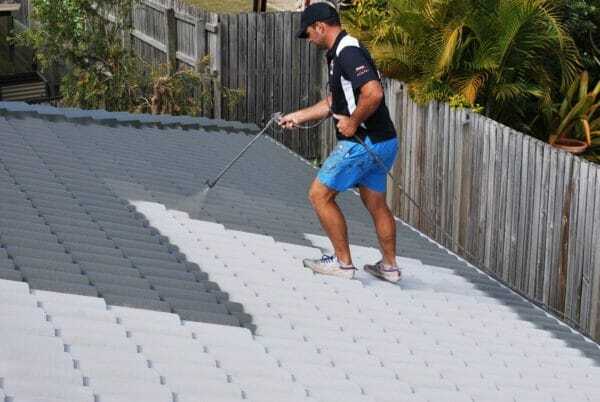 Over time in our harsh Queensland climate, your roof paint begins to fade and the roof coating breaks down, resulting in bare, exposed roof tiles, and a rather unsightly roof. Fading roof paint can also be a result of poor quality roof paint or your previous roof paint company incorrectly applying the product. At Brisco Roofing we are proud to deliver premium roof painting workmanship in hand with our highly trained and experienced Tradesmen, who are employees of Brisco Roofing, not contractors that fly by night. We believe no corners should ever be cut, ever. This including our products. We only use the highest quality roof paint available on the market, Nutech Paints. We back this with our 10 year warranty on all of Brisco Roofing’s workmanship and products. You can view Nutech’s Colour Chart here. At Brisco Roofing, we have earnt a solid reputation by consistently delivering quality along with great customer service at a fair price. With over 25+ years of hands-on experience, our team has the knowledge and experience to ensure your roof painting will be nothing short of perfect. Click here or Call our friendly team for your free quote today on 1300 166 209.
painting your roof can provide you with many more benefits. Become another happy Brisco Customer… click here for your free quote! is thrilled with their roof restoration and experience with Brisco Roofing. We value our Customers and respect your home. Ensuring it is left as it was when we arrived. We ensure every roof restoration is completed to the highest of standards by using the latest techniques and highest quality products on the market. Our team are highly trained and experienced in roof restorations and the Dulux AcraTex System. You can be at ease knowing your investment is protected with a 10 year warranty on all Brisco Roofing’s workmanship and products. Pour yourself a coffee and sit down. We have blogs for you to peruse through about all things roofing and home related. Brisco Roofing a wide range of roofing services to suite your needs. Our services include: Roof Repairs Changing broken tiles, roof sarking paper repair, flashing repair, as well as re-bedding and re-pointing your ridge capping. Meet Ged, Brisco Roofing’s Owner. We are pleased to be associated with the best brands on the market. Our friendly, professional team are here to help. Contact us for your obligation free quote. Brisco Roofing are your roofing experts, with over 20 years of hands on experience you can trust you are in safe hands. From your roof restoration, tiled roof extension, tiled roof repair through to skylight and whirlybird installs we are here to help! Very happy that we chose Brisco Roofing. The job was carried out in an efficient professional manner and we are very happy with the result. Would not hesitate to recommend this company. I am a property manager dealing with maintenance issues constantly. When it comes to roof issues we can always rely on Ged and his team. They are prompt, reliable, professional and reasonable in pricing. I don't have any hesitation in recommending Brisco roofing to anyone who needs any roof related maintenance done. Good work, Ged and his team! Thank you. Thank you to the team at Brisco Roofing! We were appreciative of how quickly our roof was restored and just how lovely, professional, hardworking and helpful the entire team was. The whole process from first enquiry to having our roof completed was simple and smooth. I don't have any hesitation in recommending this roofing company. Good work, team! Our dealings with Brisco have been nothing short of fantastic. They showed professionalism throughout the whole process. Ged and the team are hard working, honest, clean and very communicative.Will highly recommend Brisco to anyone who's looking to have their roof restored.